We have just two weeks left before we say goodbye to Temeraire the dragon. For more information on the novel, visit Naomi Novik's page. There will be a contest for an autographed copy announced soon as well!! My thoughts on the series that has spanned a decade and captivated me from the beginning are below. The concluding novel of the "Temeraire" series has arrived. 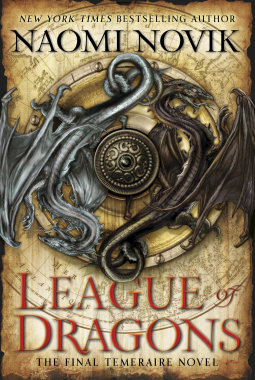 After many, many months of anticipation (and a full circle of my time on Netgalley), I had chills picking up League of Dragons. It is the conclusion to a nine book series with which I have had my ups and downs. The bar has been set pretty high, even for a dragon. Utmost honesty and realization here--the level of hype means I was going to be undoubtedly left wanting with this novel. I was not disappointed with this novel, just left a little flat because I had an entire year to hype it up in my head despite my best efforts not to do so. The war with Napolean is on its last legs and all stops must be pulled to ensure a victory. The precarious balance of Lawrence and Temeraire's position in society with their battle prowess is felt the most in this novel. There is plenty of tension to keep the pages turning. Where it all fell a little flat for me was the politics. Wars are not won through their heroic battles; they are won afterwards in a drawing room. I get that. Showing me all the sides of the war is novel worthy. Lawrence's decisions are very guided by the reception of his sense of duty compared to the leadership. I was just disappointed to see so much precious page space dedicated to the politic maneuverings when I fell in love with this series for the dragons in the war for Europe. I got a lot of verbage and very little action. There were many characters missing that I would have liked at minimum a cameo for the final novel. The ending was finite, but again, flat and slightly rushed. Overall the book felt like a trope of socioeconomic commentary instead of the fantasy debate on how the world would have been if we had dragons. I still happily recommend everyone read the "Temeraire" series. Being able to read the series all the way through without interruption is a large recommending factor as well.